– AS EMPRESAS QUE INVISTAM PASSAM A TER UM CRÉDITO DE IMPOSTO EM IRC ATÉ 25 POR CENTO, PARA INVESTIMENTOS ATÉ 5 MILHÕES DE EUROS, E DE 10 POR CENTO PARA A PARTE DO INVESTIMENTO EXCEDENTE. – QUANDO ESTAS EMPRESAS NÃO APRESENTAREM LUCROS NOS PRIMEIROS TRÊS ANOS, O VALOR DO INVESTIMENTO PODERÁ SER DEDUZIDO AO IRC A PAGAR NOS 10 ANOS SEGUINTES. THE PORTUGUESE OFFER is a brand new exhibition where businesses and consumers will be able to meet, sample and buy directly from Portuguese producers – in quantities ranging from one box to many pallets. A space for the Promotion and Sale of Portugal through the diversity of their products -handicrafts, food, shoes, textiles, art and decor, real estate and tourism – and Cultures. The international prestige enjoyed by the Portuguese brands allows THE PORTUGUESE OFFER Exhibition to export and introduce its pioneering and innovative business model, assuring the success in reaching the small businesses in England. The 1st edition of THE PORTUGUESE OFFER will take place in Thetford and will be a “business to business” event, offering products and services for the small businesses in UK. An Exhibition designed to give opportunity to local small businesses to buy directly at producer’s prices and to import as many goods as they wish. Inside all visitors will find specialized international transport companies to supply services from one box to full pallet(s) or truck.For special products we supply freight forwarding advice or services to organize import of goods like wine and others paying special taxes or needing special certificates. After this event THE PORTUGUESE OFFER will remain active to organize many others exhibitions and also as a marketing service to support any UK company interested in import or export and visit Portugal. THE PORTUGUESE OFFER will take place on October 18, 20014 in the town of Thetford organized by the largest Portuguese newspaper in UK ‘AS NOTICIAS’sponsored by BES – Banco Espirito Santo, the largest financial group in Portugal, and international Portuguese magazine PORT.COM Communities. Following the invitation sent earlier to participate in our business golf tournament, please find below more detail information for our Business Golf Tournament event. We are proud to announce that this year, once again, we will host our golf tournament in partnership with Câmara de Comércio Luso-Sueca (CCLS). 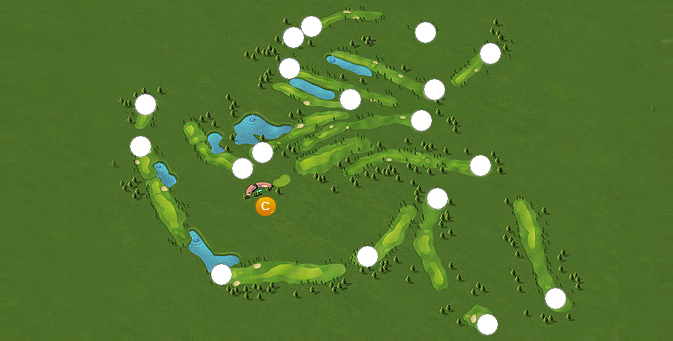 The tournament will be SHOTGUN with individual Stableford and full handicap rules starting at 08h30 a.m. The traditional lunch-buffet and an award ceremony follows at the end of the tournament. We remind you to register your handicap with www.fpg.pt and that you may bring friends and family to this tournament. We would appreciate your reservation and respective payment by September the 23rd in order to ensure your place. O IWA – The International Water Association divulga o Business Forum: “Abastecimento de Água e Saneamento em Países Africanos de Língua Oficial Portuguesa – Visão, desafios e perspectivas de evolução”, promovido pela CNAIA -Comissão Nacional da Associação Internacional da Água, a qual agrega a APDA, APRH e APESB. Esta iniciativa, terá lugar no próximo dia 23 de Setembro, 3ª feira, entre as 12h00 e as 13h30, na sala Business Forum n.º1 do centro de Congressos de Lisboa, no quadro do Congresso Mundial da Água (IWA 2014). Alertamos para o facto de a capacidade da sala ser limitada a 50 pessoas, pelo que todos os interessados em participar neste Fórum, deverão manifestar a sua intenção para o secretariado da APESB, ao cuidado de Carla Galier (cgalier@apesb.pt), até ao próximo dia17 de Setembro. O acesso à Exposição do Congresso e participação nos Business Forum é livre, sendo que a Organização apenas solicita registo prévio dos visitantes. Para o efeito, o procedimento é muito simples, bastando aceder ao link: http://www.iwa-exhibitions.org/visitors-registration/. This year’s competitiveness report by the World Economic Forum praises Finland for its innovation and education. 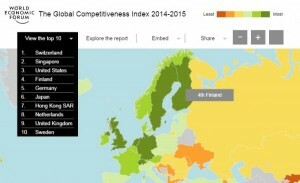 Finland ranks fourth in the World Economic Forum’s Global Competitiveness Report 2014–15. The top five of the most competitive countries according to report are Switzerland (1), Singapore (2), United States (3), Finland (4) and Germany (5). From last year Finland lost one position when it was ranked third overall, but it still kept its first position among the EU member states. The Global Competitiveness Report 2014-15 assesses the competitiveness of 144 economies based on 12 “pillars” which include institutions, infrastructure, health and education, labour market efficiency, technological readiness, innovation and business sophistication. In this year’s report Finland occupies the top position in the health and primary education, the higher education and training and innovation. Finland was also ranked high in institutions. Finland was lacking in market size, in labour market efficiency and in macroeconomic environment. A Portugal Ventures está a lançar o Programa +Inovação +Indústria, pelo qual irá investir na criação de novas empresas, como resultado de spin-offs empresariais e/ou de iniciativas de quadros, empreendedores, investigadores ou entidades de I&D, que visem a produção de bens, equipamentos e serviços destinados à modernização dos sectores de base tradicional, abrangendo todas as formas de inovação (de produto, processo, modelos de negócios e organizacionais). Toda a informação referente ao Programa +I +I poderá ser consultada em http://www.portugalventures.pt/en/contents.html?hrq=442, bem como já é possível gravar na respectiva plataforma online toda a informação do projecto candidato, o qual poderá serformalmente submetido a partir de 15 de Setembro até 15 de Outubro. 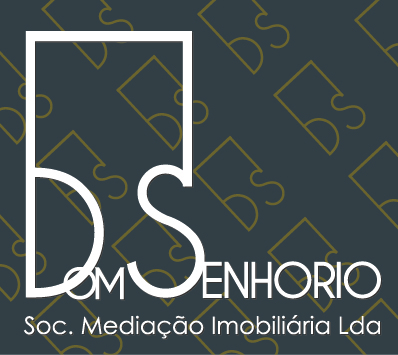 As inscrições são gratuitas e devem ser feitas directamente nos sites das respectivas associações parceiras na divulgação desta iniciativa. Os projectos seleccionados pela Portugal Ventures poderão beneficiar de um investimento de capital até 1.5M€, aplicado por tranches, mediante o cumprimento de objetivos de execução do plano de negócios. While on the move, a company from Oulu, Finland, has developed software to make it easier for day care providers and parents to communicate with one another. The UK company Parenta has concluded a distribution contract for the Finnish company While on the move’s Daisy software. Last year the software was licensed for distribution by the French company Liger. Daisy is an information system for early childhood education based on near field communications (NFC) technology and provides a mobile application for day care centres and family child care providers. Using the app, the provider can monitor on-line attendance reports and the hours of care provided. A new service is a web application which enables communication between parents and care providers, allowing parents to book care times, for example. Parenta and Liger are companies offering various services for early childhood education, including reporting and invoicing systems. These companies distribute the Daisy software. — As far as we know, there is no other software quite like Daisy on the market. The day care system is very different in France and the UK compared with Finland: during a typical day, children do not necessarily spend more than a few hours in day care. Care-hour tallies have up to now usually been marked manually in a notebook, so there is bound to be demand for an app of this type, says Kristiina Ilkka, Sales and Marketing Manager of While on the move. — In addition to France and the UK, we have we have been looking into the Nordic markets and Germany. The Finnish cities using the service include Jyväskylä and Oulu. Around 16,000 children are included in the system. Negotiations are currently under way with several other Finnish municipalities, Ilkka continues. While on the move was established in 2010 and employs around 10 people, including subcontractors. The company is headquartered in Oulu and additionally has offices in Tampere, Paris and Warwick, England. Deltabit wishes to change the traditional method that people use to enter their houses, i.e. keys. Since 1998, the Finnish company Deltabit has been developing various fingerprint identification methods that can replace traditional locks and keys. Their work has brought results as the company’s products are garnering interest both in Finland and overseas. Deltabit has launched the new Deltabit Gatekeeper Lite fingerprint identification product designed for access control at both business premises and at home. With this system Deltabit aims at market leadership in Finland and the rest of northern Europe. — We have no competition in fingerprint identification in Finland. Our competition lies more in the manufacturers of older systems, i.e. 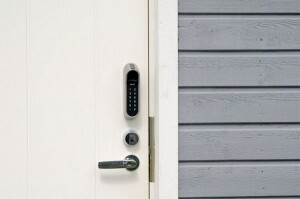 traditional locks at home and access control systems for companies, says Jukka Hosio, the company’s Managing Director. Deltabit’s products have already been sold for some time in Russia and Estonia and sales began in Poland in June. The company’s goal is to continue expanding to one or two countries each year. Sweden is the company’s next target market. Sales of the Deltabit Gatekeeper access control and working time monitoring system, launched earlier by the company, increased six-fold in Finland in 2013. According to Deltabit, people’s awareness of fingerprint identification has increased following its arrival in smart phones and it is becoming increasingly prevalent. — Fingerprint identification is now in the same position as the mobile phone game markets were five years ago, i.e. on the verge of explosive growth, Hosio says. A AICEP realiza, de 17 de setembro de 2014 a 17 de setembro de 2015, o ROADSHOW PORTUGAL GLOBALque irá percorrer doze cidades de norte a sul do país com o objetivo de reforçar a sua política de proximidade, indo ao encontro das empresas que querem iniciar ou aumentar os seus negócios internacionais. O ROADSHOW trará a Portugal representantes da AICEP em vários pontos do mundo e contará também com o conhecimento de diversos agentes económicos sobre a melhor forma de abordar os mercados que serão analisados. Em cada uma destas iniciativas serão apresentados o perfil do mercado e as oportunidades de negócio em vários setores de atividade, o que será complementado com o testemunho de empresas. O primeiro ROADSHOW PORTUGAL GLOBAL inicia-se no dia 17 de setembro na cidade de Leiria, onde serão analisados o mercado do Japão e da Polónia. Serão apresentadas oportunidades de negócio nos setores da casa (Japão) e agroalimentar (Polónia). Esta iniciativa contará com a presença do presidente da AICEP, Miguel Frasquilho, que fará uma intervenção sobre a internacionalização das empresas e da economia portuguesas.